This Thursday, the Jewish National Fund (JNF) is having a fundraiser for an 8 KM hiking and biking trail in Canada Park “in honour of all IDF soldiers who have been held in captivity.” Canada Park is built on the ruins of Imwas, Yalu, and Beit Nuba which were located in the West Bank and destroyed after the 1967 war. We will be honouring Palestinian prisoners and remembering Imwas, Yalu, and Beit Nuba, whose ruins are still visible in Ayalon/Canada Park. 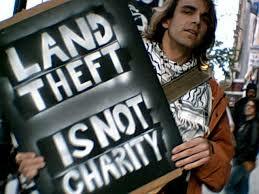 Please sign IJV’s petition asking for the revocation of the JNF’s charitable status here. See the joint Stop the JNF/IJV postcard to the Minister of National Revenue, Kerri Lynne Findley, asking her to revoke the JNF’s charitable status in Canada here, where you can either download for printing or email Stop the JNF, Canada or IJV for postcards.